The normally pristine Poudre River near the Milton Seaman Reservoir is now black with soot and ash. John McCutchan of Greeley Water says since the High Park Fire, area water managers have had to throw out the book on how they treat water coming from the Poudre River. Ash and other debris from recent wildfires cake the edge of the Poudre River, a key source of Greeley's drinking water. “It’s new for us to have to be watching the Poudre night and day. We're all faced with the same situation." McCutchan is the Superintendent of Greeley's Bellevue Water Treatment Plant which filters water from the Poudre River -a key source for Greeley's drinking supply. The normally “pristine” Poudre is the cleanest source of water in the country, McCutchan says. But since the recent fires, the river has been running black with ash and other contaminants. And that has the potential to clog up the Bellevue Plant. Greeley Water's Diversion Dam near the mouth of the Poudre River. from the river through a series of large steel pipes. The untreated water travels from the diversion dam to holding ponds. There it stays for a few days while heat from the sun kills bacteria. At the same time, a small amount of sediment falls to the bottom of the ponds making the river water easier to clean once it's sent to the filtration system. 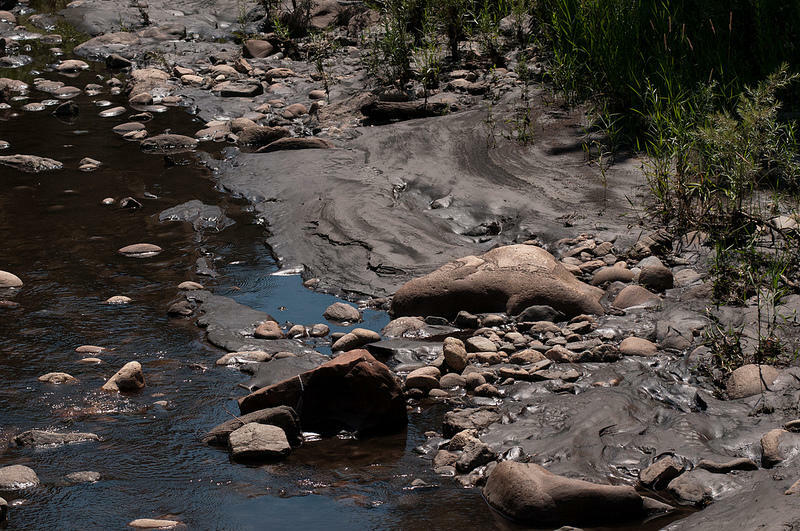 But runoff from the scorched-black earth around the Poudre has sent large particles of ash along with increased levels of iron and manganese swirling down the river. If massive amounts of these contaminates were allowed to enter the filtration system, it could render the holding ponds useless because they'd quickly fill up with sludge and sediment. To help mitigate any damage and very costly repairs, Greeley has limited its intake of Poudre River water to just 5 percent after the fire compared to an average of 25 percent for this time of year. McCutchan says Greeley water managers simply don’t know what’s going to happen when they have to return to more “normal” levels. “We’re going to have to balance the pressure to use Poudre water against what the quality of the water is today. We’re just going to have to be on top of it every single day. Some days we’ll be able to use it, some days we may not be able to use it." Similar to the Poudre, water from the reservoir west of Ft. Collins is flushed into a treatment plant on Boyd Lake in nearby Loveland. Sam Boone, a Greeley Water project manager, says just like at Bellevue, a heavy duty filtration system is working to keep Greeley’s drinking water clean. Once the water is ready for drinking, it's pumped roughly 30 miles uphill by massive 800 horsepower water pumps to Greeley. 800HP water pumps at Greeley Water's Boyd Lake Water Treatment Plant. What Happens When The Boyd Lake Facility Closes? The Boyd Lake facility is a good backup system. But since its treated water has to be pumped to Greeley, it's more costly to operate vs.taking the gravity fed water from the Poudre River. That's why it's only used during the height of irrigation season. And with the farming season drawing to a close, the plant is on the verge of shutting down for the year. This means the city of Greeley and John McCutchan are going to have to take a hard look at what’s going to happen when they’re forced to rely more heavily on the contaminated Poudre. The city of Fort Collins has just started blending water from the Poudre back into its supplies. Each water utility knows that things will change depending on rain and the subsequent runoff into the Poudre. They’re also looking ahead to next spring and the annual winter snow melt, and what that runoff will mean for the river and next year’s water supply. With recent wildfires in northern Colorado now under control, the City of Greeley is focusing on protecting its drinking water supplies. This week the USDA's Natural Resources Conservation Service announced that it is awarding the city $500,000 to help mitigation efforts. The Central Colorado Water Conservancy District is looking for more water. But they need more money do do it. Spirits were high on Sunday at this year's annual whitewater race. The race was run in "blackwater" as soot ran into the Poudre River from High Park Fire burn areas.